Here's What Happened When A Nonprofit Group Gave Cameras To Nepali Earthquake Survivors : Goats and Soda They lost family, friends and cultural touchstones in the disaster of April 2015. Now they're doing "photo therapy." For the photo exhibit "Langtang Rising," a father photographed his daughter. He lost his wife and immediate family in the avalanche after the earthquake. 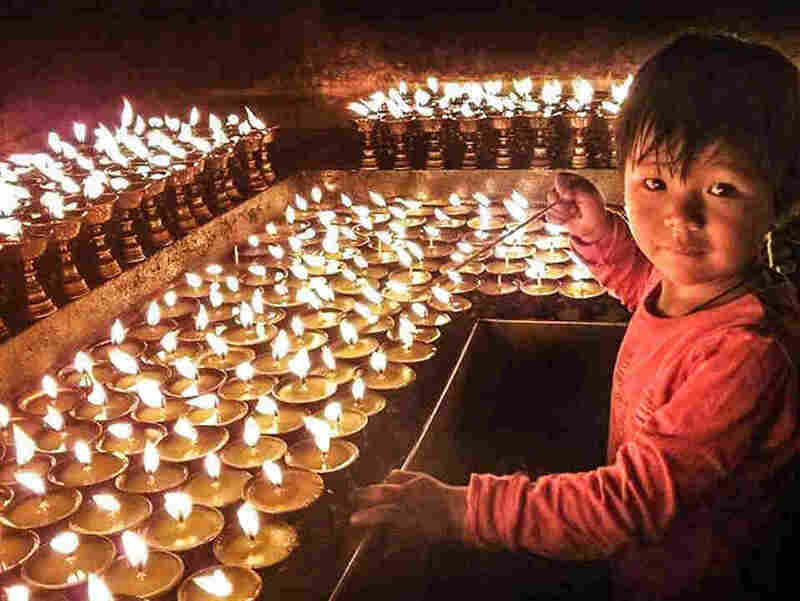 Pasang Lama is one of the survivors of the 2015 earthquake in Nepal that took 9,000 lives across the country, including his parents, brother and more than 30 relatives from his home village in the Langtang Valley. To cope with his loss, the 24-year-old has turned to an unexpected hobby: photography. "After the earthquake, we lost everything, even the culture," Lama says. He and other young survivors from Langtang have started photographing their lives post-disaster. 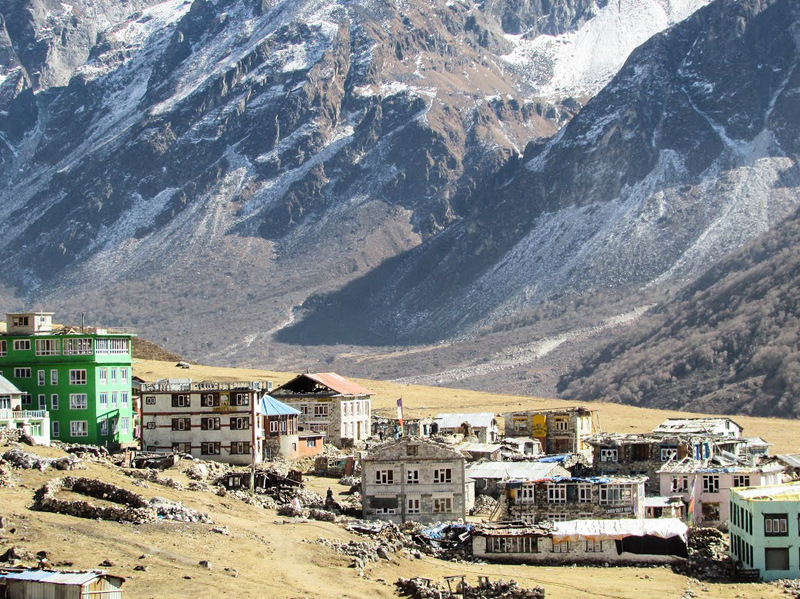 The village of Kyanjin Gompa after the earthquake. It sits in the Langtang Valley, which was hard hit by the quake and the avalanche that followed. Chheten Drolma and her niece embrace. Drolma's sister — the little girl's mother — died in the disaster. 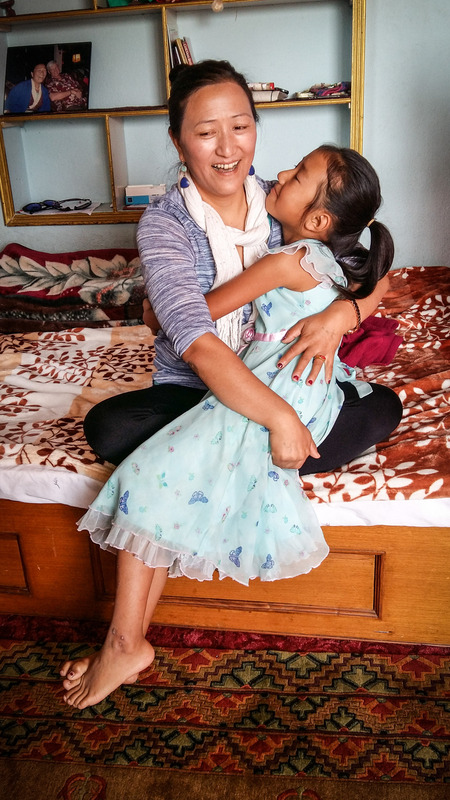 Drolma is now in the process of adopting her late sister's three daughters. Their photos are now part of a photography exhibit, displayed in cafes in Kathmandu last month and in Langtang now, triumphantly titled "Langtang Rising." The images are the result of a month-long photography workshop in November organized by a Colorado-based nonprofit called Picture Me Here. The group gives cameras to people displaced by disasters or migration and offers guidance about photographing their stories as a way to heal. Lama has a lot of trauma to come to terms with. On the morning of April 25 last year, he woke up early to hike back to the hotel he ran at Kyanjin Gompa, in the Langtang Valley. He' d been up all night for a ghewa, a Buddhist death ceremony, at his family's home in the village of Langtang, a few hours walk away. Of the photos Pasang Lama took, this is his favorite. "You didn't sleep all night. Stay here and rest," he remembers his brother and father telling him. But guests were waiting at the hotel, so he trekked back, downed a cup of coffee and was preparing lunch for them by noon when the ground started shaking. Ushering the guests out of the hotel, Lama watched as, "one by one stones from my house started falling." When the shaking stopped, Lama was relieved to see his house still standing. Then came the avalanche. A community elder blesses a man. A tidal wave of rock, snow, and ice — later measured at have half the force of an atomic bomb — crashed down from the 20,000 foot mountains above. "I thought I would die," he says. During the months-long fuel crisis, people had to wait in long lines to buy diesel and propane. 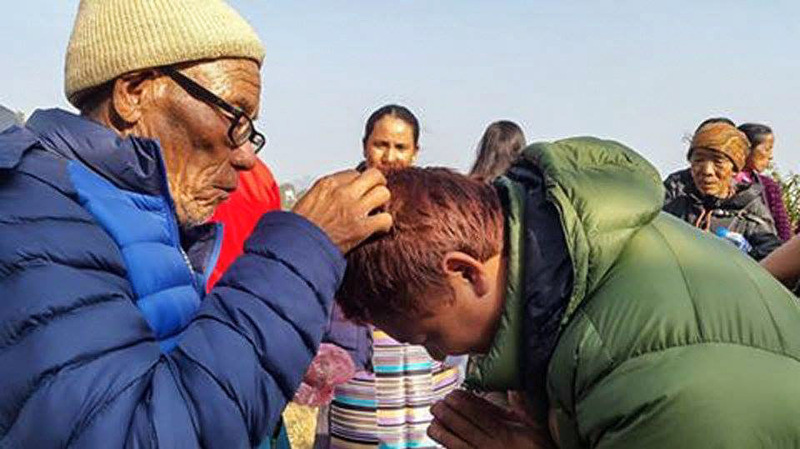 In retrospect, his decision to head back to Kyanjin Gompa may have saved his life. The full force of the avalanche ripped through Langtang, burying the village of charming stone houses and taking around 300 lives in its wake. News reports described Langtang as the site of the most concentrated devastation from the quake. Many of the village elders perished in the disaster. But with the help of Picture Me Here, a group of 18 young people are now photographing and documenting the cultural symbols and customs that were kept alive by their grandparents, from traditional clothing to shamanic healing practices. The images they're making are part of join the larger Langtang Memory Project, a museum now being built. The photos are also a way for survivors to tell their own stories. After the earthquake, international media swarmed to Kathmandu. The photos that made it to the rest of the world mainly showed the destruction in the capital, though many buildings were actually intact. Meanwhile, rural areas like Langtang, which weren't photographed because of their remoteness, were much worse off. Few photographers could stick around to show the hard work of rebuilding over the year amid struggles like a five-month fuel crisis, critical medicine shortage and ongoing political turmoil. 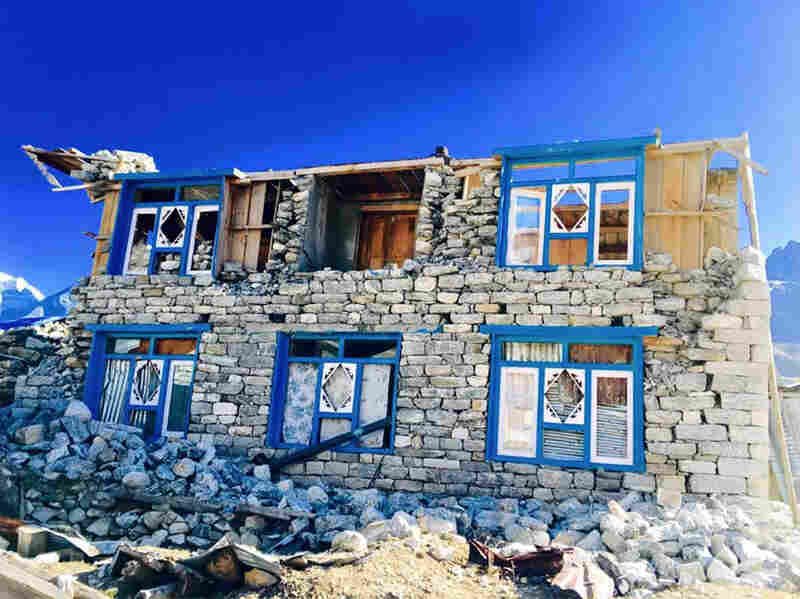 The photos taken by the youth of Langtang collection does show some images of destruction — Lama's favorite of his own pictures is a broken stone house against a brilliant blue sky. But they also show the resilience of survivors as they honor the past and push on with their lives. A series of images in the "Before the Earthquake" theme show entries in a guestbook of Dorje Bakery, which was destroyed in the earthquake. 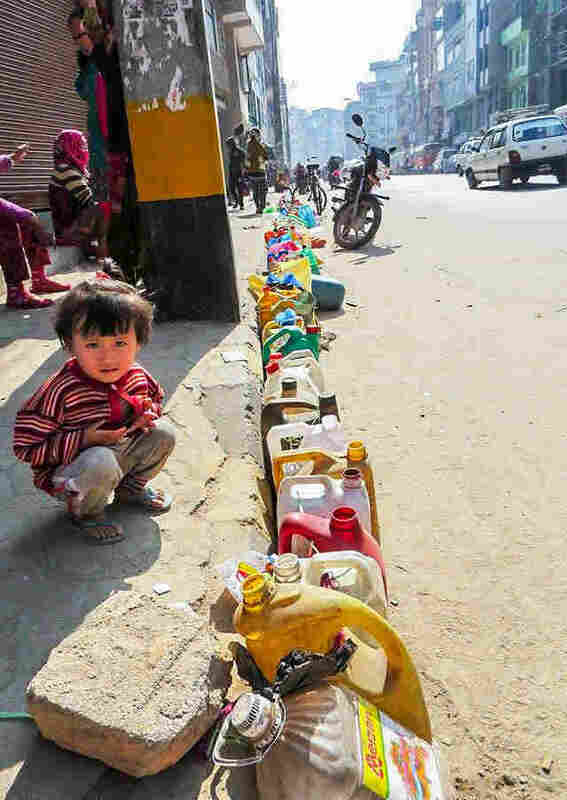 A photo from the "Life in Kathmandu" theme shows a child squatting by a line of empty fuel containers; the winter fuel crisis made life even harder for villagers displaced to the city. Another shows a laughing woman holding a smiling girl in a party dress in a city apartment. The woman is the girl's aunt, and she's in the process of adopting the child, whose mother died in the quake. An especially poignant story comes from Gyalbu Lama, 25, who photographed his collapsed family home, which his parents, who died in the earthquake along with his younger brother, had slowly worked on for decades. "They left us without completing their dream. Now who could carry it out? I don't feel I can," he writes in a caption. Pasang Lama hopes that the images inspire tourists to come back to Langtang, which was one of the country's biggest trekking regions before the earthquake. In villages across Nepal, where job prospects are dim, many young people leave to study or work abroad in countries like India or in the Middle East. Now, in places like Langtang, they have returned to become the keepers of their villages. But in order to stay, they need tourism to rebound and inject much-needed cash back into the village economy. The number of tourists to Nepal plummeted by more than 30 percent, to around half a million visitors, last year. That's because the earthquake hit during peak trekking season, and the months-long fuel shortage kept travelers away. Pasang Lama's father ran a hotel in the village but had bigger plans: he dreamed of starting his own trekking agency to benefit the whole community. Lama and his cousin, Chhime Tamang, another Langtang photographer, have since started Tenjin Eco Treks in his name. Proceeds from the sale of their photos to visiting tourists will also go into a community fund for rebuilding. "We don't want aid," says Pasang Lama. "We want to get paid for our services." As Nepal struggles to rebuild one year after the tragedy, the young survivors prefer to get back on their feet by themselves.